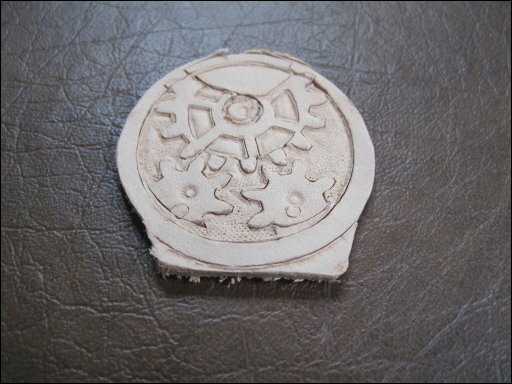 Gears design, cut on the cricut and tooled. Of the various leather scraps I tried, it appears necessary to use reasonably thin "tooling leather" with the deep-cut blade holder. The normal blade holder doesn't provide enough clearance (this seems to be one major difference between them). Setting the blade to a depth of around 4-5 seems to work fine (I haven't extensively tried other depths). In addition to using the deep-cut blade, I also tried using a modified bit that I made (from sawing down a nail of the same diameter of the Cricut blades) and it seems to score the leather somewhat in a way that can come out better with a wash. I tried two patterns to experiment with: for the first one I used a fleur-de-lis pattern built into the Cricut. For the second pattern, I used a Steampunk-style gears design that I put together in Inkscape. For the very small patterns, just holding the leather to the Cricut's cutting mat worked ok. For the larger pattern, the leather wouldn't hold effectively. After trying a few glues (rubber cement, superglue) which didn't work, I tried stapling the leather to a worn cutting mat. That seems to actually work reasonably well, although it's important to ensure the staple doesn't get caught in the Cricut's mechanism. 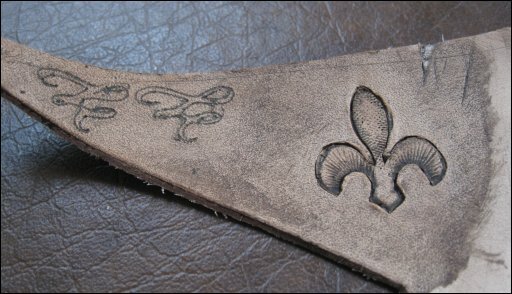 The biggest problem that I encountered was that the Cricut appears to lose registration for complex leather patterns, possibly due to the thickness of the leather interfering with the in-and-out rolling distance movement assumptions, or due to the mat shifting due to the leather scrap not having uniform thickness. I will need to experiment a few more times, although I'll need to get more large scraps first. 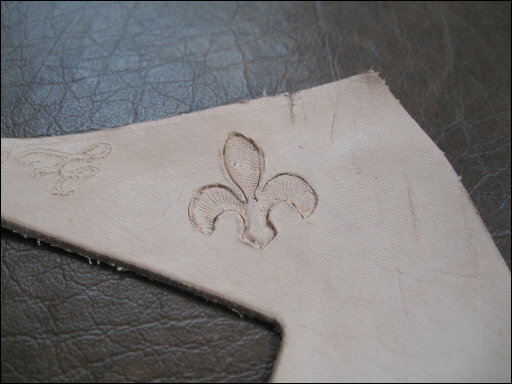 Following cutting the designs into the leather, I used a mixture of tools to work the leather after spraying it with water. In addition to the basic Tandy leather tools, I also found that jewelry screwdrivers worked extremely well for tooling smaller parts of the design. As this is my first attempt (and as the Cricut mat slipped a few times with the gears design), some parts didn't work out as well as I'd hoped. Fleur-de-lis after coloring. The pattern in the upper-left wasn't actually cut, but was embossed into the leather with my modified "nail bit" on the Cricut. 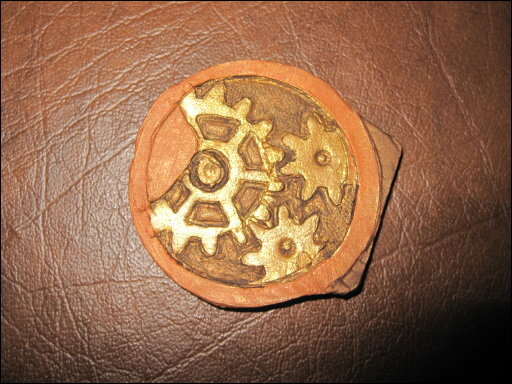 For the gears design, I then painted it using acrylic paints, also using some antiquing medium (and rubbing some of the darker color off). Note that some of the gears pattern is off as the Cricut slipped and cut some things in the wrong places. I'm going to have to play with making a few more other things with this technique. I will need to find ways to minimize the impact of the Cricut slipping on the material. 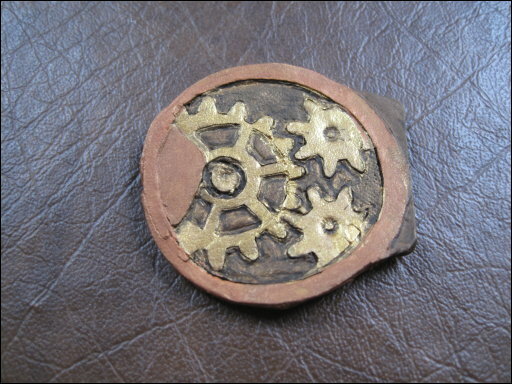 In general, I think the more organic/natural/older designs may work better than something industrial such as gears. At some point I'll have to try making some larger pieces as well, although I have a few other projects that I need to work more on first. Note: We seem to be using our Cricut for plenty of crafty projects, including many wedding projects. I've recommended the Cricut that we have to a few people, but given that they are now suing the makers of the Sure-Cuts-A-Lot software that makes it useful to us, I can no longer recommend the Cricut. It looks like there are a number of new entrants to this market since we got ours that are hopefully less litigious against people who make their devices actually useful, so we may explore getting one of those at some point.